The S&P Energy sector has delivered the worst returns of eleven sectors for four of the past five years. Reflecting investor disdain, energy is now around 6% of the S&P500, down by half in the past decade. 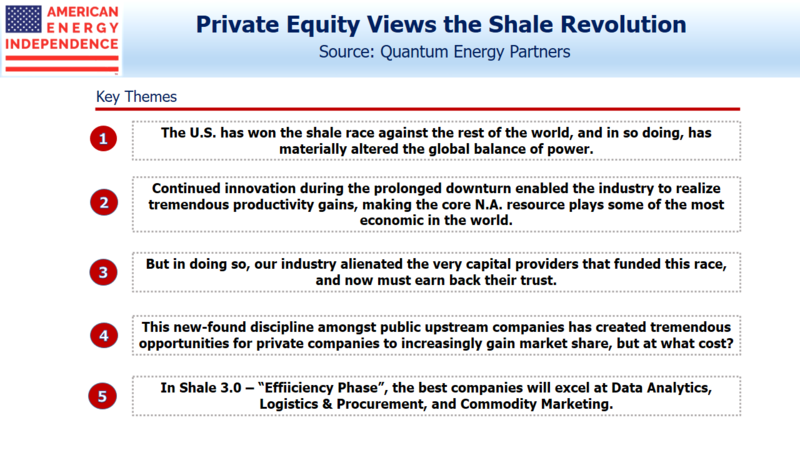 Realizing the full potential of the Shale Revolution has demanded a lot of capital – over $1TN by one estimate. Management teams’ desire to grow has increasingly conflicted with investors’ insistence on greater cash returns. 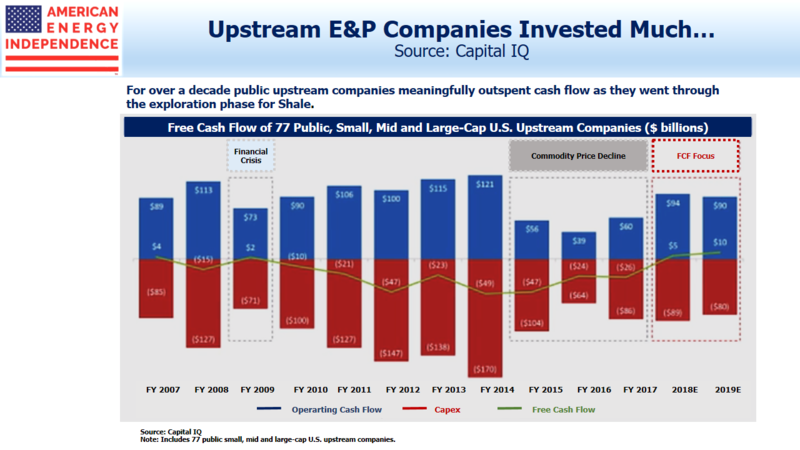 In midstream infrastructure this has been especially acute, with the traditional income-seeking MLP investor enduring multiple distribution cuts to support growth projects. On Twitter, an anonymous, well informed energy investor created a humorous NCAA-type bracket to identify the most capital-destructive management team among publicly traded energy stocks. Each pairing is resolved through online votes, with the ultimate winner earning a most ignominious title. One comment asked if there was another sector with as wide a gap between management self-perceptions and those of investors. Yet there’s a class of investor that continues to find energy attractive – private equity. A recent presentation by S. Wil VanLoh Jr. of Quantum Energy Partners offered a useful perspective. Public equity investors are repelled by the energy sector’s persistently low free cash flow, with profits too frequently plowed back into new production. By contrast, private equity (PE) funds with their locked up capital are drawn by the internal rates of return, which they find attractive. Their ability to outspend cashflow for several years as projects are developed can’t be matched by their public counterparts, whose investors are sensitive to quarterly earnings. Although this hasn’t led to any significant public companies being taken private, it has led to PE becoming a steadily bigger player in shale. They recognize that the U.S. has already won the shale race against the rest of the world. Growing market share and increased geopolitical flexibility must surely lead to good investment returns. But around $1TN in capital has not all been well spent, and any sector recovery depends on management teams regaining the trust that has been lost. The industry’s operating efficiencies are well known. Capex per well has been declining while output has soared. Pad drilling has brought scale and corresponding efficiencies, with rig productivity up 6X in the last five years. Since 2010, acquisition and development of shale resources by PE has grown from 10% to over half the total. 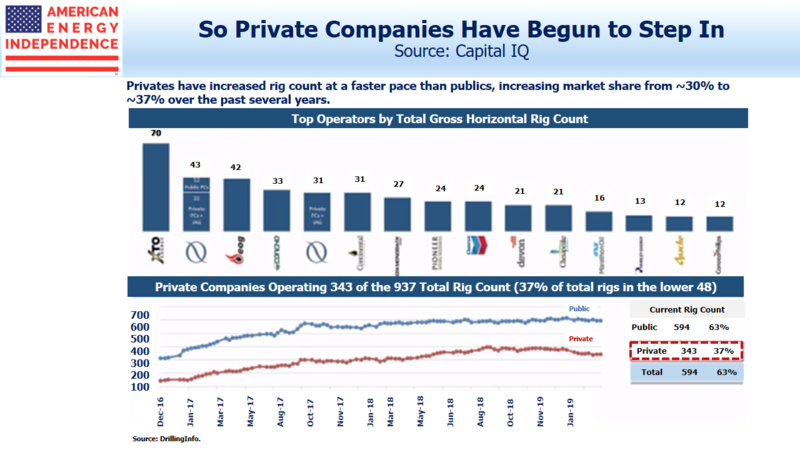 PE rig count is estimated at 37%, up from 20% six years ago. 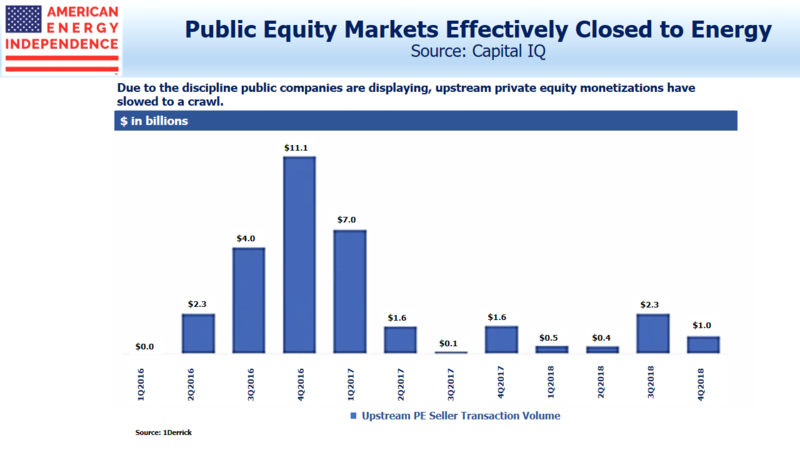 Nonetheless, the shrinking of the public equity investor appetite for energy has impacted PE, because it’s constrained their ability to exit via a sale of assets to a publicly traded company, or via an IPO. There were no MLP IPOs last year, illustrating that the public equity markets are closed to energy companies. So PE holding periods have gone from 2-4 years to 4-7. 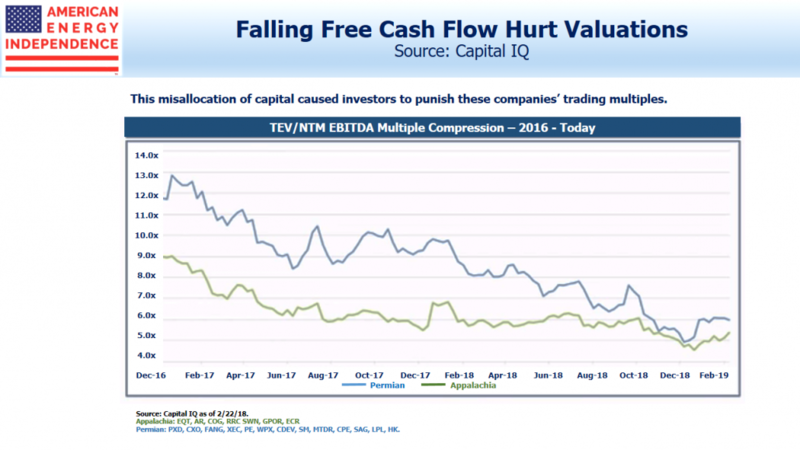 Meanwhile, public companies are responding to calls for greater cash flow discipline by moderating growth capex and redirecting more cash back to investors through dividend hikes and buybacks. 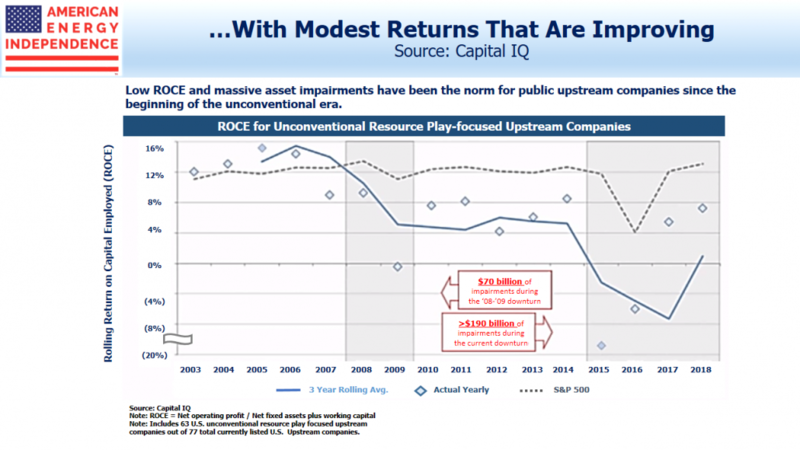 There are also signs that capex plans now adjust more quickly to altered circumstances than in the past. Several upstream companies lowered their planned spending during 4Q18 as oil slumped. On the midstream side, Magellan Midstream (MMP) recently have shelved an expansion project because of insufficient shipper demand. Several projects are planned to increase capacity for the largest crude tankers, which require deepwater ports offshore. Perhaps concerned about overcapacity, Kinder Morgan pulled out of a JV with Enbridge to develop a deep water crude oil export facility, although the project is still expected to proceed. A consequence of this new capital discipline is that public companies’ criteria for buying assets from PE owners include that they be FCF-positive, so as to maintain promised cash returns to stockholders. A positive NPV is no longer enough, which is forcing PE investors to develop their assets more fully than expected, taking up more time and capital. Infrastructure funds, which often include midstream energy infrastructure in their mandate, raised a record $88BN in 2018, up from $75BN in 2017. PE investors have been active in the pipeline sector. Blackstone invested almost $5BN in two deals with Targa Resources (TRGP) and Tallgrass (TGE). Funds managed by Carlyle, Stonepeak and Arclight have also committed capital. Although the 2014-16 MLP price collapse continues to haunt investors, there is a chronic shortage of assets that can generate stable cashflows over two decades or more. The recent drop in U.S. ten year yields to 2.4% is one example. Ten year German Bund yields are negative again, and French oil giant Total issued perpetual bonds at 1.75%. PE investors buying infrastructure understand this better than public markets, and a publicly owned pipeline with a distributable cash flow yield above 10% looks like a mispriced asset. It’s why we think the sector has substantial room to appreciate. Of course there is a considerable amount of PE fund investments in the midstream in addition to the investments in Tallgrass and Targa. First Reserve has two funds in CEQP, one as an investor and one as a joint venture partner. Energy Capital Partners has a fund invested in SMLP. Riverstone had a fund, the 10 year term of which recently expired and which led to the ET position, invested in USAC. Many of these funds have 10 year terms, and there is always an issue as to what happens when the fund has to dispose of its position. Some funds can be extended for a year or two. The joint venture First Reserve fund partnering with CEQP is not term limited, but that is not usual. Energy Capital Partner’s fund in SMLP expires next year, after it receives its deferred purchase price obligation from the partnership Personally, my opinion is that I would not invest with ArcLight, given how it behaved with AMID (of course, AMID’s management was less than forthcoming in its disclosures and did not produce compelling results). And the many PE companies which own their non-public midstream operations most often do so through LLCs or partnerships and not by C corporations. Enjoy these articles every time. Please move the graphs over to the left margin so when I save these posts to WORD, the graph does not get cut off by being wider than the text.